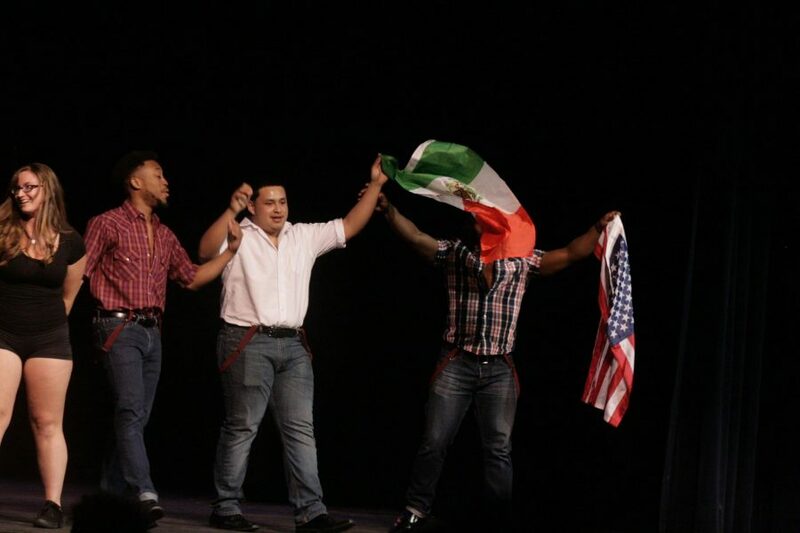 On Thursday, April 14 the Lakeland community was carried across the world as a packed auditorium came out for another successful International Night. Students greeted the audience as the Matisyahu song “One Day” played as the background audio to short video clips that introducing this event. This well designed video hyped an already anticipated crowd by showing sequences of each country’s flag, followed by an interview scene while the students welcomed the audience in their country’s native language. During the international fashion show, the clinking gold coins, eye captivating colors and detailed embroidery on the traditional outfits from China and other countries crossing the Bradley Center’s platform, visually transported the attendee’s overseas. Even the American models, representing Prom attire, with a couple wearing the shimmery sparkle of a light pink, floor length gown and suit jacket, staged the standard outfits of this high school event for all to see. Technology was not in favor of this night, as those in attendance saw and heard. Glitches in microphone audio and song start-ups halted many performances, freezing onstage three Hmong dancers who waited for their cue as their dance’s song continued playing. A moment of great warmth was witnessed as the audience clapped to the beat of a tune unaccompanied by its dance routine. Less than a minute later, the stage’s curtain closed and reopened as these dancers resumed their traditional Hmong routine with even more support from the crowd. Despite these hiccups, the performers outdid themselves by gaining such favor that even the night’s glitches aroused laughter and support from all in the auditorium, once resolved. Demonstrating unity at this cultural celebration, the audience was invited to join the international students onstage as they learned three different traditional dances. Mimicking the student instructors onstage, those who joined followed these students as they moved to rhythms from Brazil, Ethiopia and Congo. It was the desire of the hosts and performers to transport their Wisconsin viewers to every country as each component of this night unfolded. The performances seen accomplished this cultural objective as each presentation showcased their passion for these cultural roots.